The Institute of Policy Studies of Sri Lanka (IPS) on Monday (25) named its state-of-the-art auditorium as the ‘Dr. 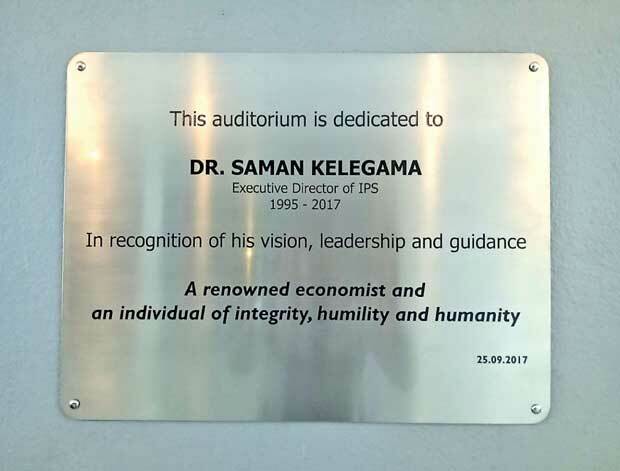 Saman Kelegama Auditorium’, dedicating it to its late Executive Director, in memory ofhis vision, leadership, and guidance to the IPS, especially in establishing the Institute’s Head Office at Independence Square. The ceremony was attended by Dr. Kelegama’s wife Eranthika Sirimavo Kelegama and his two children, Chandana and Jayathri, as special guests, as well as the IPS staff. Dr. Kelegama joined IPS as a Research Fellow in 1990 and was appointed its Executive Director in 1995, a role he held for over two decades, until his sudden demise in June 2017. One of his key initiatives was to try and obtain land and funding to construct a permanent Head Office for the IPS. Heworked tirelessly towards this end and succeeded in obtaining a gift of land from the Government of Sri Lanka and funding from the Royal Netherlands government. In 2010, the IPS shifted to its custom-built Head Office, housing not only its high-tech, 100-seat auditorium, but also library resources, and conference rooms that have allowed the Institute to expand its research activities and hold countless seminars, conferences, stakeholder meetings, workshops, and training programmes. Dr. Kelegama devoted his life to making IPS a center of research excellence and a leading regional think tank. The auditorium is dedicated tohonour his memory and continuing legacy at the Institute. Comments will be edited (grammar, spelling and slang) and authorized at the discretion of Daily Mirror online. The website also has the right not to publish selected comments. Social media blocked for over 24 hrs in SL after bombing... Blocking social media platforms yield effective results? All the content on this website is copyright protected and can be reproduced only by giving the due courtesy to 'dailymirror.lk' Copyright © 2004 Wijeya Newspapers Ltd.